(L-R): Brian Bradford, AJ Burton, Daniel Hill, Jon Singer, Billy Lynn, Phillip White, Frank Rogers, Eric Hurt, and Ross Cameron. 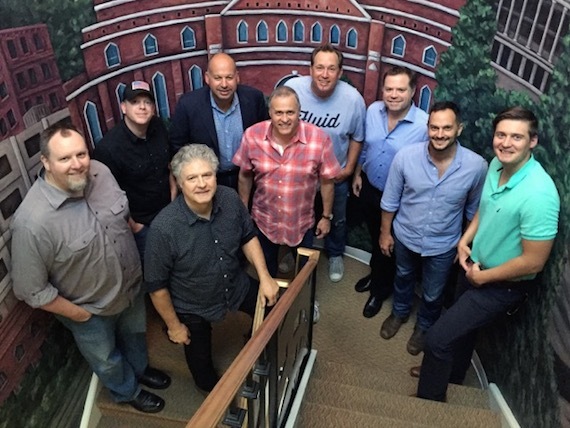 Spirit/Fluid, the Nashville-based joint venture between Spirit Music Group and Frank Rogers’ Fluid Music Revolution has signed Phillip White to an exclusive publishing deal. White’s career skyrocketed in 2000 as co-writer of “I’m Movin’ On” with D. Vincent Williams. Recorded by Rascal Flatts, the song became a No. 1 hit and was named Song of the Year by the Academy of Country Music and the Nashville Songwriters Association International. In 2003, White co-wrote the Reba McEntire hit “I’m A Survivor” which also became the theme song for Reba’s self-titled hit TV show. White’s impressive list of co-writes includes Neil McCoy’s “Billy’s Got His Beer Goggles On,” Blake Shelton’s “Nobody But Me,” Scotty McCreery’s “The Trouble With Girls,” and Darius Rucker’s “Lost In You” (co-written with Rucker and Mark Nesler). His cuts on the Act of Valor soundtrack include “The Best I Can” co-written and performed by Jake Owen, and “Whatever Brings You Back” co-written by Ronnie Bowman and performed by Wynonna Judd. “Fluid Music Revolution and Spirit Music Nashville are excited to welcome Phillip White to the family. Phillip is a great songwriter with a track record of creating career songs for artists. We can’t wait for the world to hear what Phillip does next!” said Rogers when making the announcement. “I am extremely excited to be at Fluid with AJ and Frank and equally excited to work with everyone at Spirit Music Nashville. I’m looking forward to this new chapter in my career!” said White.